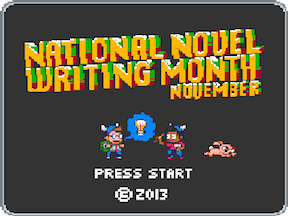 November approaches, the time when writers around the world use crisp air and pumpkin lattes as fuel for National Novel Writing Month, a 30-day blitz of drafting that challenges participants to complete a 50,000-word book before the month is out. It's a wild challenge, full of frustration and joy, broken pens and little sleep. This year, YA Highway wants to help you---yes YOU!---become one of the thousands of people who realize their goal of creating a living, breathing first draft. Or finish revisions! Or write a few short stories! Or perfect a synopsis! Wherever you are in your writing process, YA Highway wants to help make the month of November the most productive month of the year for you. Every day of November (and even a few late-October prep days), YA Highway will be sending out an e-mail note of something inspiring. A blog post that helped one of us get through a rough writing patch, or a picture of a sloth clinging to a llama*. A daily dose of advice, motivation and camaraderie to remind you that we're in this writing game together, and when you succeed, it makes the world of kidlit better for us all! What a great idea. Sign me up!